Can anyone assist? I'm looking for photos that depict the nose art (wasp/bumble bee art) that was applied to the nose of our Westland Wasp HAS 1 Helo's. 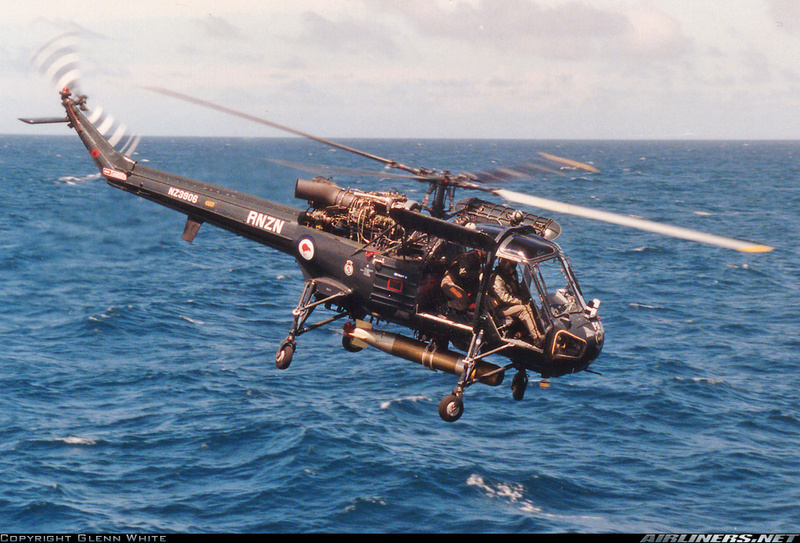 I'd also appreciate information as to whether this artwork applied to ALL the RNZN Helo's or just a 'select' few? What period was this applied? History behind the idea etc, etc. Any background information (or posting of photo's) would be much appreciated. have photos from the Nineties of several Wasps and they had no nose art on them at that stage, it must of been a either 60s, 70s or early 80s thing, the nose art must of been different on each Wasp as I have seen a photo with a wasp dipicting a thing with horns on it on the nose. I was on Wasp Afloat from 1987 to 1992, and was responsible for painting a couple of the Nose Art panels. I started on HMNZS Wellington with Wasp 3907, but was shifted to HMNZS Southland via HMNZS Monowai for 6 months. It was while we were on Southland that the Nose Art Games began. Southland was on the way to the scrapyard, but took quite some time getting there... her symbol was the Southland Ram, so we had two Nose Panels made up. One was for our everyday affair, and that was Cecil the Ram from Footrot Flats, tired out after doing his duty leaning up against a wire fence going "Sheesh!" and the other was for when we were at war, with an angry Ram's Head with Horns. Great stuff. Welcome to the forum Obwan. It's interesting how many NZDF aircraft have had Footrot Flats nose arts (also an Orion and Orange Roughy Iroquois '08, at least). Nowadays Footrot Flats is hardly seen anywhere any more. We'd love to see these photos please chaps. 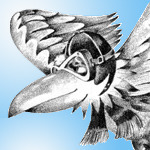 Hi - is anyone still looking for nose art for the RNZN Wasps? 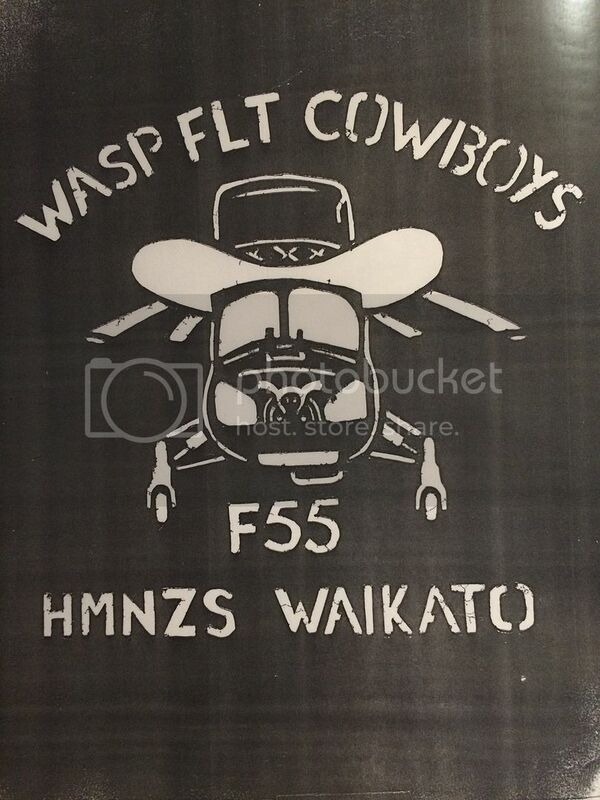 I actually designed the "Wasp Flight Cowboys" artwork on my first cruise as an RNZAF CPL, Wasp Flt (3 Sqn) on the Waikato in 1989. It started out as a stencil - when wasps from other flights landed on our deck we would get the flight deck captain to hold it on the deck a bit longer than usual whilst the two rearmost lashing hands would crawl under and spray-paint the rear avionics door with the design. Other flights started to do the same - the Wellington had an "F69ers" logo I think. The moniker "Wasp Flight Cowboys" came about because the Waikato Wasp FLt was called "a bunch of cowboys" by the CO Wasp Flt at one stage when we had done something to raise his ire. The bumlebee on the nose of NZ3906 stayed for my two years with Waikato Flt but after I moved on to TCPC it was replaced with a larger version of the Cowboy Wasp. The whole nose art thing was disapproved off, so when we were "ashore" i.e. based back at Hobsonville between deployments the plain old nose panels with just the aircraft number would be fitted. When deploying, the first thing that would get swapped once the wasp landed aboard after leaving Auckland harbour would be the painted nose panel. I think at this time every deployed wasp was doing the same thing. I still have the original pen drawings for the design, plus there should be a bunch of photos kicking around in a shoe box somewhere. I am sure the actual nose panel is probably above the bar in some ex-waspies man shed somewhere, along with the time-ex tail rotors and all the other stuff that we weren't supposed to keep. I also have another design that was used to lighten up the official reports/logs etc that had to be sent back whilst deployed. It is a wasp sitting in a deckchair on a beach under an umbrella sipping on a cocktail. Good to see the post from obwan earlier - racking my brains to think of who was on Southland Flt back then - Bags, Stretch, OB and Beachy (god rest his soul) if I recall. Yup still interested in seeing any photos that may still be lurking in your attic! I am working on a "Waikato Wasp" that's the theme name for the painting, so I'd be interested in any details as well , they were a unique looking type .. frankly really did look like the name. Definitely still interested in photos, and stories. The Wasp gets too little mention these days. I think we have the Ram panel at 6 SQN. At least I think there is a wasp panel with artwork, and as much as I walked past it daily for nearly four years I can't picture what it is. Next time I'm back down that way (Wednesday I think), I'll have a look for it and get a photo if I can. I've been looking through my old Albums, and while I found many photos of time at sea, I only found one poor shot of Wasp 07 with my Ramshead on it. It was winter 1991 on our round the South Island tour and we steamed into Milford Sound for a tour of the beautiful Sound. Here is the Wasp Departing the deck wearing our Southland war paint. You can see Mitre Peak behind. It was cold, but beautiful, and it really put the tiny size of out Frigate into perspective alongside 7000 ft Mountains and 4000 ft Waterfalls. I'll keep looking for others. I know I had a couple more, but just not sure where they are stored. As to the Website, I couldn't Login, so have a go yourself to upload it. To reply to Phil, I do remember seeing the Nose Panel hanging up at 6-Sqn last time I was there, but it was a while ago now. I managed to dust off some old photos, turns out they were in the cupboard under the stairs. Let me know if this whole "onedrive" link thing above doesn't work - I'm a bit of a newbie at uploading things for others to see. I have a lot more negatives too and it looks like I didn't keep many of the prints, but I have been inspired now to go through the negatives to see whats in there. 01: the original cowboy wasp sketch drawn in my notebook. 02: a photocopy of the stencil. I remember cutting this out of a piece of A4 cardboard whilst sitting on the spare engine in the back of the hangar. 03: someone else's wasp on board the Waikato (I can't remember which tail number), the "Wasp Flt Cowboys" stencil is there from having previously landed on the Waikato, "Alcatraz Flt" was the HMNZS Southland if I remember correctly (so called because their flight commander exercised a stricter approach to discipline than on the Waikato) and "Oiled" was from the HMNZS Endeavour (I think Wellington Flt was embarked on Endeavour at this time - whichever frigate was in refit their wasp would deploy aboard Endeavour or Monowai as required). 04 no.s 1,2 and 3: some shots in Sydney Harbour. We would dock at Garden Island, its now a bunch of top end apartments. 05 and 06: a rarity in that there were two wasps on the Waikato. 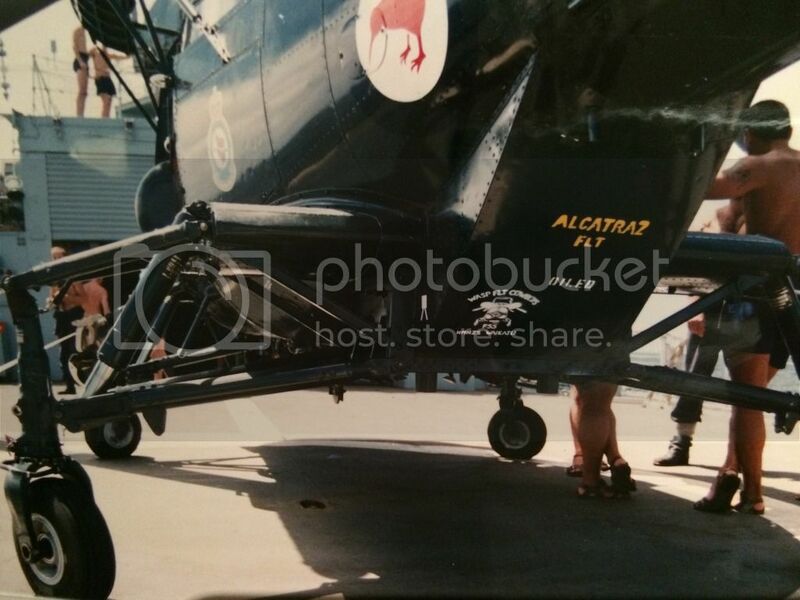 The wasp from another Frigate (probably Southland) went u/s - we were having a period of major Rolls Royce Nimbus reliabilty issues at this time and we had to juggle things around to be able to get the broken one into the hangar and spot 3906 out onto the flight deck. Kind of reminds me that once out of NZ waters the whole uniform thing got pretty casual. I can't recall if this was off the coast of NSW or somewhere in the South China Sea. The "F11" on the nose signified that the Waikato was the no.1 frigate for the time being (there's probably a correct navy term for that). That's me in the sunnies - I think I still have the sunnies, the hair and flat stomach seem to have gotten lost somewhere since then though. 07: The Waikato aft petty officers mess had a stuffed parrot as a mascot. They took it pretty seriously, it had it's own service number and stuff like that. After a few beers one night we decided it would be a good idea to duct tape it to the front of a depth charge for a live drop the next day. In retrospect we should have waited until closer to the end of the cruise as weren't too popular after that particular stunt. 08.1: another rarity, the pilot (aka the Flight Commander) washing the helicopter between flights - good on ya Bars, the best pilot (civilian or military) I have ever come across and the best Officer that I have served with. 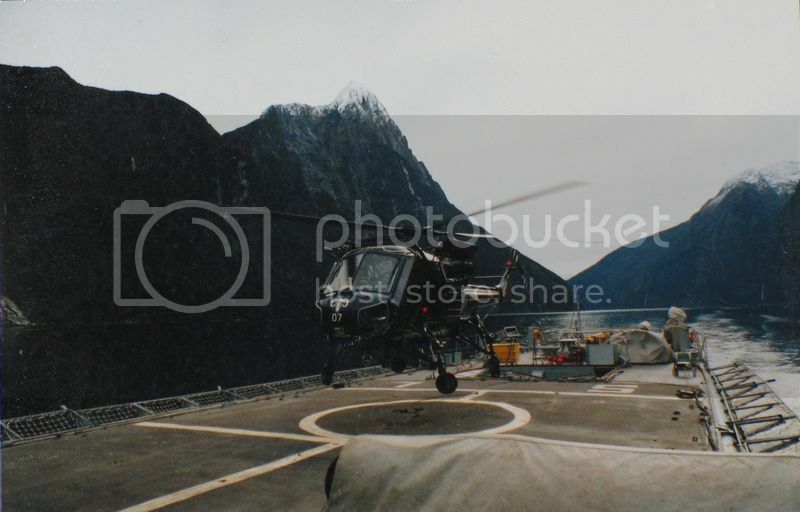 This is when we were deployed on HMNZS Monowai in the Bay of Islands. 08.2: a low hover, below the level of the Monowais flight deck. 08.3: what the crew do when the helicopter is out flying. 10 no.s 1,2 and 3: the Wasps weren't just seafarers, this was where the pilots would get to practice mountain flying in the Southern Alps flying out of Dip Flat in the Wairau Valley inland from Blenheim. 11. slinging loads onto Campbell Island in the Southern Ocean. 12. the daily status form sent from Wasp Flt each day. - All the Hueys that 3 Sqn could get into the air circa 1990 in one go over the 3 Sqn hangar. Hmmm... turns out the link doesn't work, I'll get that sorted today somehow. Hi exwaspy, if you cannot get the link sorted, email me the photo at dave_daasnz@hotmail.com and I'll upload it. I have just fixed OB's photo too as his didn't work either. And here is the photo that Paul Harrison (tbf25o4) mentioned he had, which he's kindly sent through for me to post. I had a look around at 6 SQN today, there were two wasp panels with Frigate names on them, but no ram. I thought I had seen something like it at some point, but either it is somewhere else, or I just imagined it. 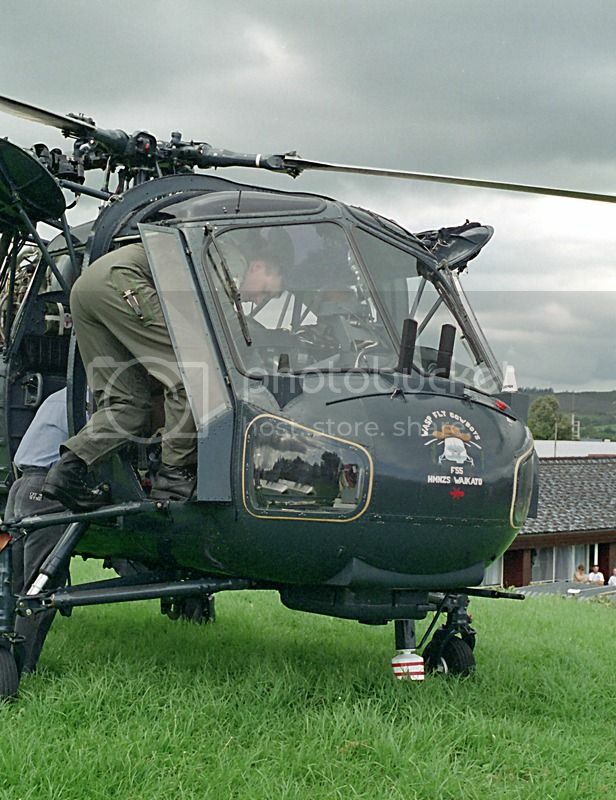 Here we are with attempt no.2 of uploading the Wasp pics. Thanks for the pointer to the photobucket instructions - exactly what I needed.